I did pack those zucchinis with a ton of veggies, I couldn’t resist! Summer garden veggies make amazing meals! Fresh veggies are so versatile and there is not much better than veggies straight out of the garden or farmers market! 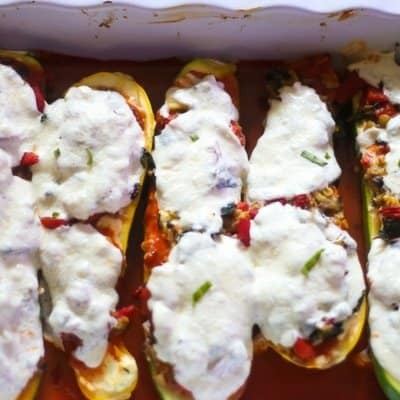 One of my most popular recipes to date is Zucchini Tomato Eggplant Bake plus Video Thus we have these stuffed zucchini boats filled with garden fresh veggies and the cheesy goodness that makes lasagna. What I really love about this recipe, besides it tastes fantastic, is the versatility of ingredients! Feel free to use this as a base and adjust the veggies according to your families favorites. I also love using this as a fridge cleaner. Take all those veggies that need to be used and make them into these veggie boats. My family has an array of eating preferences. Gluten-free, vegan, carnivore, they are driving me crazy! Me and the hubs, easy easy, healthy and delicious! 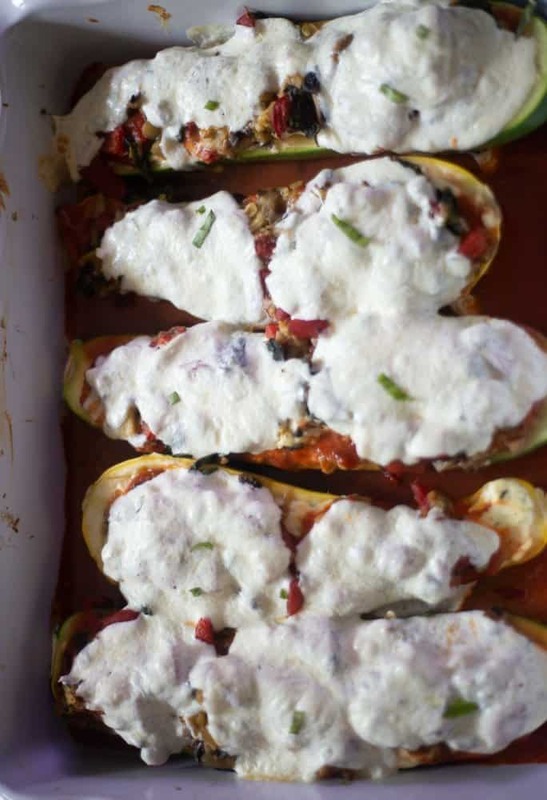 This zucchini boat recipe makes everyone happy! I can sub vegan cheeses for my vegans! My boys actually love this as is but they snack on it a lot and add in cooked ground chicken and turkey. Such a versatile recipe. Use fresh zucchini and be sure to wash zucchini well. Feel free to swap out veggies to what your family loves. To keep this meal vegan, I have used tofu ricotta and vegan mozzarella with excellent results. 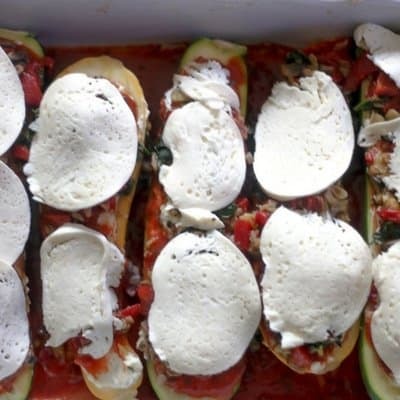 These healthy zucchini boats can keep in the fridge, well covered for about 3 days. We are in full swing of #FarmersMarketWeek and if you missed Mondays recipe, don’t forget to check out my Gazpacho Soup Recipe. Remember to check out all the other recipes from my fellow food blogger friends, delicious recipes! A big thank you again to our host of Farmers Market Week, Ellen who runs Family Around the Table! Slice the zucchini down the center in 2 equal halves. 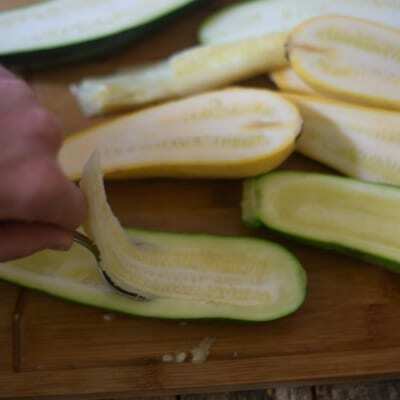 Use a spoon to remove the centers of the zucchini. The flesh will be added to the other vegetables that will be sautéed and added back on the zucchini boats. 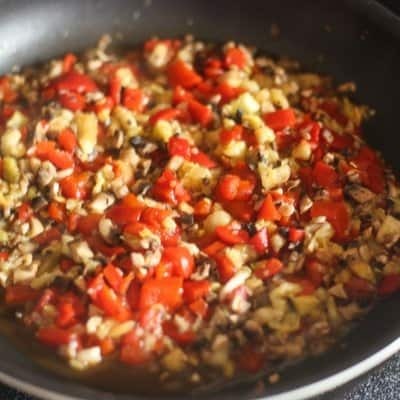 Add to a saute pan, olive oil and the veggies. Saute about 5 minutes to sweat the veggies. Remove from heat and set aside. In a medium bowl, combine ricotta cheese, Parmesan cheese, egg. dried parsley, salt, and pepper, to taste. Set aside. Use a 9 by 11 rectangular dish. 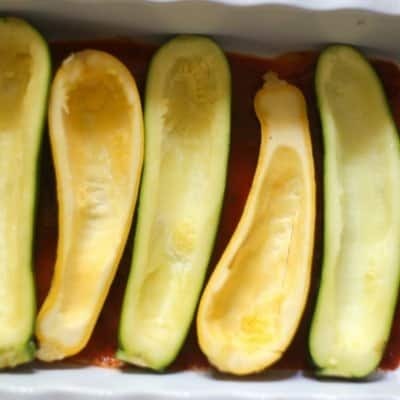 Add about 1 cup of the marinara sauce and place the culled zucchini halves skin side down in the pan. 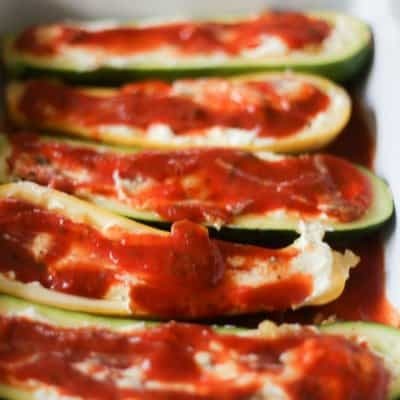 Top the zucchini halves with the cheese mixture and distribute 1 cup of Marinara Sauce. Distribute the veggies between the zucchini. Top with fresh mozzarella. Bake about 25 minutes. Cheese should bubble when zucchini is cooked through. Serve and enjoy! 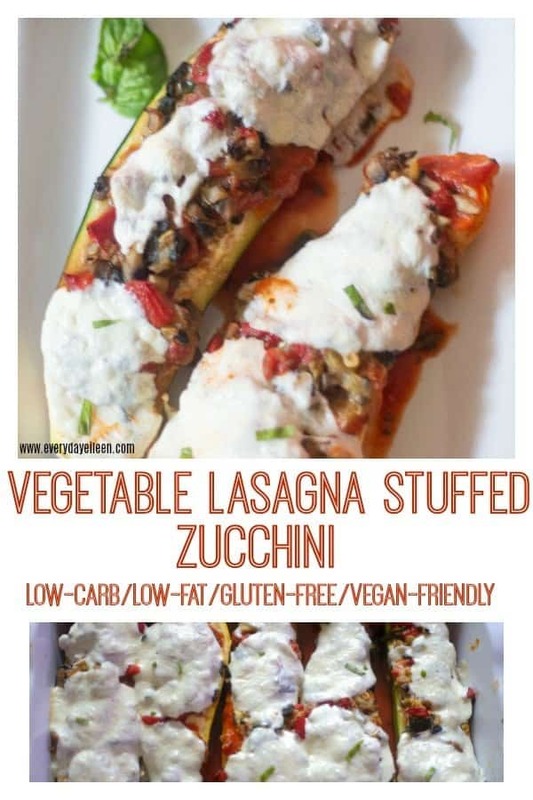 Do you like my Vegetable Lasagna Stuffed Zucchini, giving it a 5-star rating and share comments below would be super helpful! 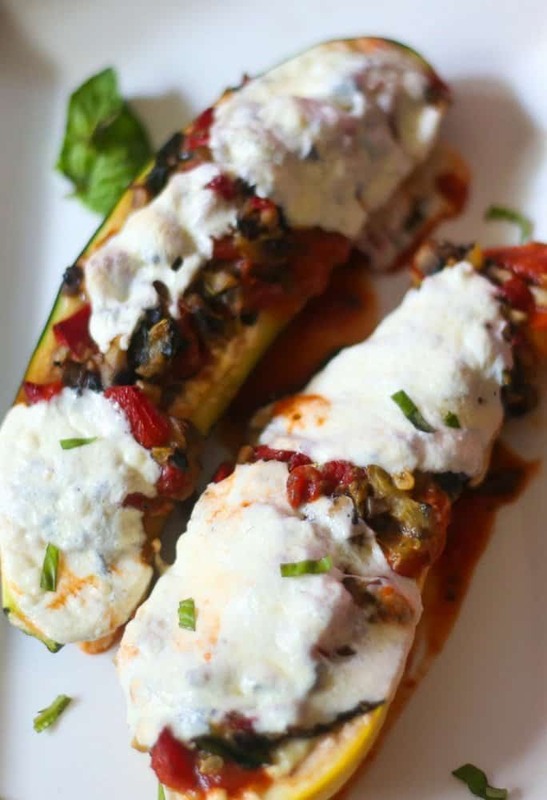 Healthy, delicious filled with veggies makes an amazing Vegetable Lasagna Stuffed Zucchini. 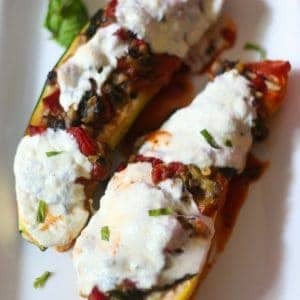 Using garden veggies and some cheese to make the most amazing low-carb, low-fat healthy zucchini boats. In a large saute, over medium heat add olive oil. Add in garlic, onion, saute for about 2 minutes. Then add in the mushrooms, spinach, red pepper, tomato, season salt, pepper. Stir and set aside. 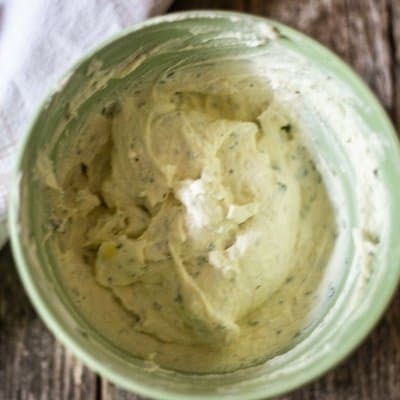 In a large bowl, combine Ricotta Cheese, egg, parmesan cheese, salt, and pepper. Test seasoning. Set aside. In a rectangle Pyrex pan that will hold the zucchini, add 1 cup marinara sauce to the bottom of the pan. 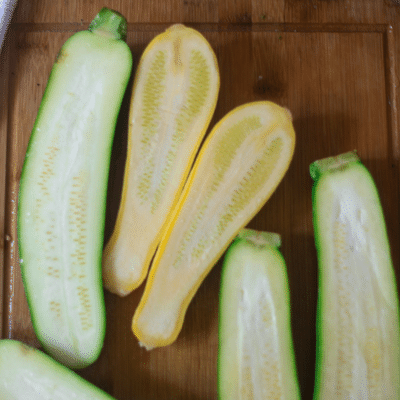 Place the zucchinis in the pan, skin side down. Distribute the cheese between the zucchinis. Then distribute the cheese to the zucchini. Mmm! These are sure to be a hit at my house. Luckily I have zucchini on the counter too ?